I went out at 10 this evening to find a reasonably secluded spot, set up my camera, and waited till 22.10. 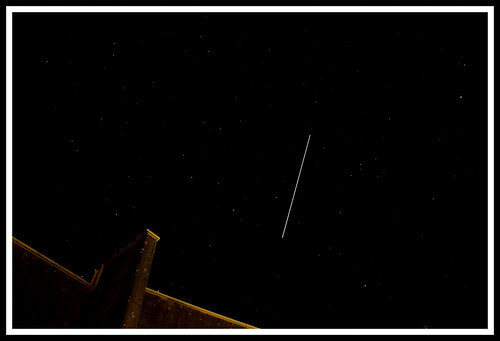 I'd not seen the International Space Station before, knowlingly, but as the final set of solar panels have been installed, making it the second brightest object in the night sky after the moon, and tonight looking like a particularly good chance, I thought it was worth a look. As it came into view, the image of a satellite 100 meters across, 350km above the Earth, racing along at 27000 kilometers an hour with six humans on board was really quite a stunning sight. At magnitude -2.3, it was easily brighter than any of the other stars in the vicinity, and I presume anyone who didn't know better would have thought it a fast moving plane, slightly yellow in colour. 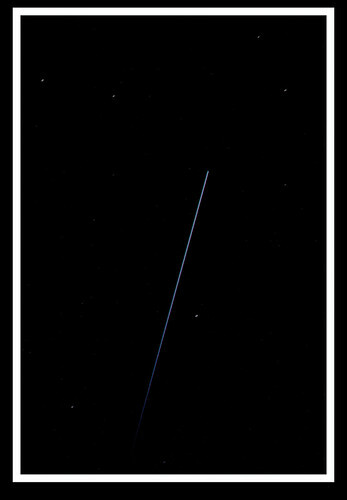 I took a few 20 second exposures and rather like the last one, where you see the space station moving into the Earth's shadow, slowing fading to black. Anyway, check out on Heavens Above for when will be the next good chance to see it from your neck of the woods.